The journey through the rift becomes even rockier as the survivors are forced to take to the water, crossing a vast deepwater basin on improvised boats. To make it, Molly and the others must work together, but a rift of a different kind is forming among the survivors. If they aren't careful, it could eat them alive. New York Times bestselling author and National Book Award winner M.T. 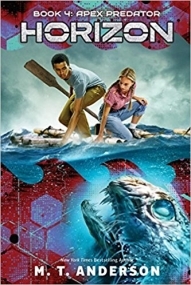 Anderson (Feed) helms this heart-pounding voyage in the epic survival series begun by Scott Westerfeld (Uglies). Both the members of the robotics team whose plane went down and the members of the Cub-Tones from the 1950s are still surviving in the scary land of the blue broccoli forests, dealing with exploding fruit and scissor birds. They do find a statue and a tree village, but still do not find any inhabitants. They do come across a journal from a whaling ship in 1855. This shows them that the world they are in has existed for a number of years, but is also an ominous warning that people have been trapped within it for lengthy periods of time. The children discover that music tends to calm one type of giant cyborg, but they also suffer a tragic loss. With Molly and Cal slowly mutating into green skinned creatures, an ever dwindling supply of food, and a plethora of monsters trying to kill them, what will the future hold for these castaways? Filled with exotic, volatile flora and menacing fauna, surviving the land of Horizon is a non-stop, pulse-pounding adventure. There are plenty of characters, and they all deal with their situation differently. Kira and Akiko can only speak Japanese, so can only communicate with Yoshi, who is bilingual. Molly is determined to be an effective leader, but is concerned about her deterioration and also the threat Hank poses to her power. Other characters like Javi, Crash and Kimberly don't have as much input into this installment, but quietly keep things moving. The real draw to this series is the video-game type adventure. Doing the simplest task involves a variety of steps, challenges, and attacks. Descriptions of plants and animals almost shimmer with the same intensity of a television screen in a darkened room. Characters make constant decisions, knowing that the wrong one might send boats flying through the air instead of sailing smoothly across the water. Death and destruction wait at every turn. Readers who enjoy the multi-author 39 Clues or Project Alpha books and want a multi-platform experience will definitely be interested in this series, which is also good for fans of series fiction like Northrup's Tomb Quest, Spradlin's Killer Species or Korman's Titanic. "Aki and Lilith are off on another exciting adventure, this time to the world of Ancient Greek mythology. This..."
"Another amazing adventure of Aki on the Parallel Crystal"
"'La Petite Josette En Provence' by Ashley Davidson-Fisher, illustrated by Martinique Louise Fisher, who so happens to be the author's..."
"The Lifters Dave Eggers, Alfred A. Knopf, 2018 Is magic enough to fix the morass of Middle America? Are..."
"This story deals with loss, which is usually a very sensitive and difficult subject, in an uplifting and entertaining way..."
"This is a delightful story about a very vain peacock who sets about ensuring he is the most beautiful creature..."
"Good book for middle school kids- a true snapshot of the struggle to fit in the middle school social scene..."
"The book was just simply great! Surprises, twists and stuffs! Well I just loved Aki and his amazing adventures!..." "This exciting fourth adventure begins with Aki learning about a startling family secret and having to choose between telling the..."
"'Alicia and the Light Bulb People in Star Factory 13' by Barbara Roman, illustrated by Vladimir Cebu, is a sweet..."
"This one is a lot of fun. Joe and Mary are getting ready to have a picnic at..."
"As a mother and tutor for young children, I highly recommend this novel to add to your children's book shelves...."
"Santa has always been there to deliver gifts to the good boys and girls around the world, but this year,..."
"Have you ever noticed how people are like light bulbs? They come in many sizes and shapes, varying in their..."
"While this book in occupied by a cast of monsters, it is far from scary. It is also not solely..."
"I am so pleased by The Crystal of Atum. I love Aki and the Spheres of Time series. This book..."
"This is Aki’s third trip with the Sphere of Time. As usual, he ends up nowhere near the spot where..."
"'City of Grit and Gold' by Maud Macrory Powell offers a glimpse into the lives of those who came from..."
"'The Pathway to Dragons: The Portal to Pyranis' by Hannah Hoffman is more than your run-of-the-mill fantasy story. When Billy..."